Poland is famous for its agricultural produce, and it is from this that Polish cuisine draws most of its ingredients. 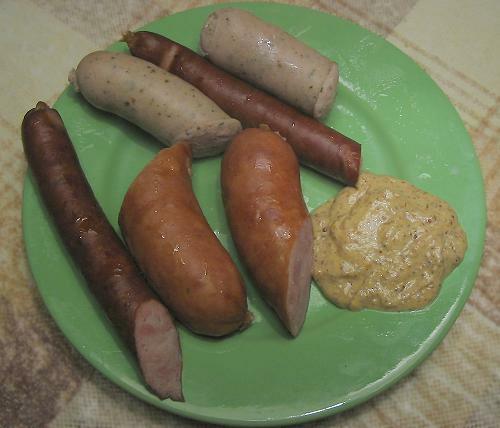 Some highlights of Polish cuisine include cereals (such as barley, buckwheat, millet, rye, and wheat), fermented diary products (curd cheese, sour cream, and soured milk), pickled vegetables (including beetroot, cabbage, cucumber, and kohlrabi), pickled herring from the Baltic, and of course for the world-famous kielbasa (the Polish sausage). Barszcz - The Polish version of borscht. A soup made from red beetroot, onions, garlic and other vegetables. Bacon, other meats, or cut vegetables may sometimes be added. On Christmas Eve, a vegetarian version of soup is eaten with small dumplings (uszka) filled with mushrooms or kapusta kiszona (the Polish version of sauerkraut). Bigos - A stew made from fermented cabbage (kapusta kiszona - the Polish version of sauerkraut) or fresh cabbage, with meat. Mushrooms, tomatoes, and honey are also usually added, as are various seasonings such as bay leaf, caraway, juniper berries, marjoram, pepper or pimento. Various meats may be used, including bacon, beef, ham, kielbasa (Polish sausage), pork (sometimes smoked), or venison. Bigos is usually served with rye bread and potatoes. Kartacze - Potato dumplings stuffed with meat and marjoram. Kielbasa - A traditional Polish sausage. There are many varieties, which fall into two broad categories: fresh and dry. Knysza - Pita bread with meat and cabbage. Kopytka - Baked potato dumplings served with bacon, cheese, or onion. Kwaśnica - A stew made from meat and kapusta kiszona (the Polish version of sauerkraut). Zrazy wolowe - Beef chops in sauce. Zrazy wolowe zawijane - Chopped dill cucumbers and onions wrapped with thin strips of beef. WHILE OTHER INSTANT POT COOKBOOKS are poorly written, have no recipe index, lots of editing errors, bad recipes, or simply recipes that are overcomplicated, the Instant Pot Cookbook by Rachel Collins feature the best variety of well-thought-out and well-tested recipes you should expect with nutrition facts for every recipe in the book and comes with the well-structured recipe index. It includes the detailed instructions on how to use your instant pot, perfect cookbook for beginners and pro instant pot users and includes vegetarian recipes for those who are vegetarians. WE ARE REAL PEOPLE who use our own recipes for our families. We expect the best for our families and want the same for yours. The way to the hearts of your man and family is through good food on the table. Meal times can be such wonderful of times when you have the most fantastic of food on the table. We hope this cookbook will be a great help for yourself and your family. We cut no corner in our books and will cut no corners in our support of you. We know you’re a big deal and we’ll only provide you with the finest product and service around or your MONEY BACK! Handy Charts illustrating the instant pot cooking times, temperature and measurement conversion. Helpful Tips on how to adapt your favorite recipes and make the most of your instant pot. “This is now my go-to book for my Instant Pot. Love the recipes and the easy instructions. Scroll to the top and Add this amazing cookbook to your Cart and Get your copy Today! The official Instant Pot® Cookbook for every dinner duo. A HANDY OVERVIEW covers Instant Pot® best practices, shopping tips for two, troubleshooting advice, and how to scale recipes up or down. 80+ RECIPES work with all models of the 3-quart Mini and 6-quart Lux, Duo, and Ultra. RECIPE TIPS throughout explain how to double recipes, use up ingredients, modify cooking times (if needed) for Mini and larger Lux models, and divide the labor to speed prep. Catch up on your day, re-connect or just wind down with a good meal. It's more than just sitting down to eat, it's a chance to really be together. For three generations, Treasured Polish Recipes for Americans has been a favorite of cooks and diners who savor and appreciate authentic Polish cuisine. Treasured Polish Recipes for Americans preserves the integrity and unique qualities of delicious Polish cooking while making it accessible to anyone, even those with no experience preparing Eastern European food. Craving traditional Polish Kiełbasa or Kapusta Świeża na Kwaśno (sweet sour cabbage), or how about Kapusta Czarwona (red cabbage), Śledzie Marynowane (pickled herring), Czarnina (duck soup) with Kluski, or nearly a dozen varieties of Pierogi and Pączki (fried donuts with filling)? Treasured Polish Recipes for Americans includes these recipes and many many more. With almost 500 recipes, every meal and practically every dish is covered, including a multi-course Christmas dinner. More than just a collection of recipes, Treasured Polish Recipes for Americans takes the reader on a tour of Polish culinary customs, dishes, and traditions. It also gives advice on foundational cooking techniques, ingredients, and sauces enabling you to master and improvise your own Polish-style dishes. Accented with Polish folk art, this timeless cookbook offers a charming and satisfying experience for both your stomach and spirit. The Ninja Foodi is Amazing! You can cook virtually anything in a multi-cooker - from meats and main courses to rice, potatoes, vegetables of every description, dessert to even yogurt. Better yet, the Ninja Foodi allows you to prepare foods up to 70 percent faster, and 75% less fat on average, than conventional cooking methods do, which means you save energy, eat healthy, in addition to your precious time! You don’t need to learn exceptional kitchen skills to make delicious and nutritious foods in your very own kitchen. With the Ninja Foodi, you can whip up your favorite comfort foods without breaking a sweat. With this nifty kitchen device, you will be able to prepare delicious meals any time of the day. You don't have to worry about your success in the kitchen because the Ninja Foodi and this Amazing Cookbook will do the hard parts for you. Enjoy 550 Easy and Most Delicious, Foolproof, Hand-Picked Instant Pot Recipes. Anyone Can Cook. Throughout the pages of this book, you will discover а variety of sweet, savory, salty, and other delicious recipes. These flavorful dishes are hand-picked to ensure you have а hearty collection of the best recipes on hand at all times. As а result, this cookbook is the ultimate companion to your Instant pot. You are guaranteed to find а wonderful selection of traditional, modern and alternative recipes inside to suit any palette. Pick the best recipes you like and start cooking with Instant pot now. You will be amazed at how simple it is to use. The recipes are easy to follow and can be used by anyone regardless of their background. Go ahead and explore an incredible variety of nutritious and delicious recipes that you make with the magical Instant Pot. Don’t wait for another second to get this life-changing book. Get fit, happy, and stress-free life by ordering your copy right away! instant pot cookbook, instant pot recipes, instant pot cookbook 2019, instant pot accessories, instant pot bible cookbook, instant pot cookbook for beginners , instant pot beginners, instant pot baking, instant pot books, instant pot diabetic recipes, instant pot diabetic cookbook, instant pot desserts, instant pot diet, instant pot duo cookbook, instant pot cookbook for two by jessy jones, instant pot electric pressure cooker cookbook, instant pot soups, instant pot seafood, instant pot ultra cookbook, instant pot vegetarian cookbook, instant pot zimmerman, instant pot 1000, instant pot recipes for beginners. Rose also has another book you might like: Perfect Polish Dessert Recipes. In Perfect Pierogi Recipes Rose Wysocki shares both traditional and contemporary recipes for pierogi dough, fillings and toppings. Some are recipes from her Polish Mother and Grandmother. Others are recipes she's collected or developed over the years. You'll find a total of 51 recipes. They are very easy to make. Included are recipes for: 10 different pierogi doughs (traditional and contemporary), 15 savory fillings, 6 sweet fillings, 3 traditional pierogi toppings, 2 contemporary toppings, 9 compound butters and 6 sauces. You'll also find a list of 16 additional traditional toppings and 10 contemporary toppings (without recipes. )Finally you'll find a lot of information about the history of pierogi, how to make pierogi dough, different methods to cut, stuff and seal the pierogi, how to boil, saute, deep fry or bake pierogi, how to freeze pierogi and more. Rose also provides information about a couple of pierogi cutting and sealing tools that will save you a lot of time in preparing pierogi.Making pierogi at home is really easy if you have the right directions. This book will give you a head start on making perfect pierogi for your family in your home. If you have picked up this book due to curiosity on the Mediterranean diet, then we hope this book will answer all your questions! We have laid out a careful argument for the Mediterranean diet based on scientific research and all the health benefits a person can gain. There may be a few disadvantages as newcomers struggle to adjust, but the health benefits far outweigh the disadvantages. This diet is so easy to follow and allows a large variety of items to be included on the menu. That means more delicious dishes you can make so you don't get bored! The more information you have about the Mediterranean Food Pyramid and what you can and cannot eat, the more you confident you can be when buying ingredients and preparing your meals. It's all about having the knowledge to succeed on this diet and knowing the research studies that will motivate you to continue on this path. Not only will you lose excess weight, but you can improve your overall health and even increase your lifespan to live a more active life! After all, this diet is modeled after the people in the Mediterranean region who tended to eat a plant-based diet, lots of seafood for their protein source, and incorporate physical activity into their day. With the Mediterranean diet, you're following their diet and hoping to gain the many health benefits! Salt & Time will transform perceptions of the food of the former Soviet Union, and especially Siberia - the crossroads of Eastern European and Central Asian cuisine - with 100 inviting recipes adapted for modern tastes and Western kitchens, and evocative storytelling to explain and entice. Why not try the restorative Solyanka fish soup (a famous Russian hangover cure), savor the fragrant Chicken with prunes or treat yourself to some Chak-chak-fried honey cake. "Often we need distance and time, both to see things better and to feel closer to them. This is certainly true of the food of my home country, Russia - or Siberia, to be exact. When I think of Siberia, I hear the sound of fresh snow crunching beneath my feet. Today, whenever I crush sea salt flakes between my fingers as I cook, I think of that sound. In this book I feature recipes that are authentic to Siberia, classic Russian flavor combinations and my modern interpretations. You will find dishes from the prerevolutionary era and the Soviet days, as well as contemporary approaches - revealing a cuisine that is vibrant, nourishing, exciting and above all relevant no matter the time or the place."